What would you do if you knew you were going to get cancer? Long time no post—I’ve been busy! The trip to Oregon last weekend was a great success. My dad picked me up from work around 4:30 pm on Thursday and I was at LAX by 5:15 pm. Security was a breeze. I headed to the airport bookstore to pick up some reading material and after 25 frustrating minutes of not finding a decent title, I struck up a conversation with another traveler. He was from Australia and was headed home from a study abroad program. He recommended a book to me and we started to chat, and for some reason, we ended up on the subject of health insurance. He told me that his family has a strong history of breast cancer and that his sister might get tested for the BRCA gene. I arrived in Portland around 9:30 pm, and Bryce’s flight arrived shortly after. My mom and her friend Arlene picked us up and we drove out to Hood River to my aunt’s house. On Friday we went on a hike near the foothills of Mount Hood. It was beautiful—so green and lush, a welcome change from Los Angeles! I haven’t been hiking in quite a few months, so I was happy to stretch my legs. For dinner we went to Everybody’s Brewery in White Salmon, Washington. One of the cool things about the area in which my aunt lives is that it’s on the border of Washington and Oregon. Technically she actually lives on the Washington side, but Hood River, Oregon is just a few miles away. We hopped back and forth between the two states all weekend. 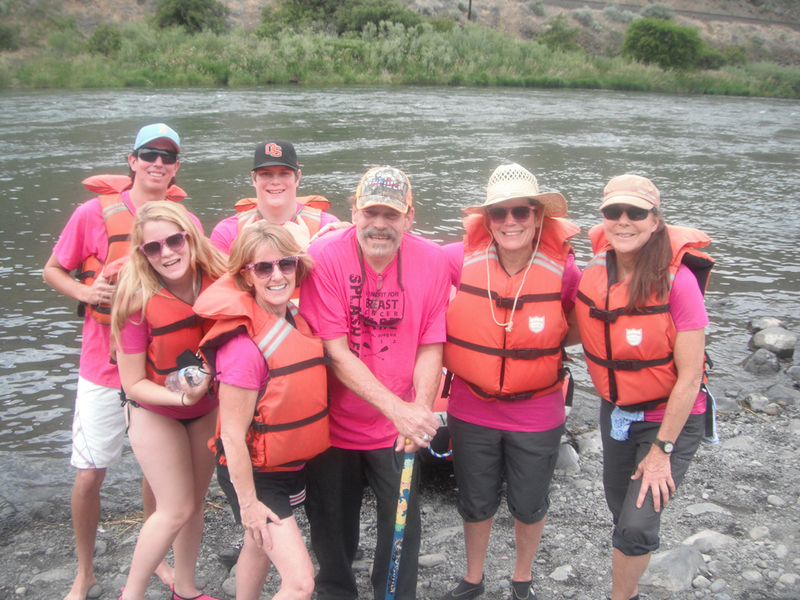 On Saturday morning we drove out to Maupin, Oregon for Splash for Pink! Maupin is a tiny town on the Deschutes River that is best known for white water rafting. My uncle Pat used to be a rafting guide there. I’ve never seen the town that crowded—there were so many people there for the event! After checking in and receiving our pink t-shirts, we met up with my cousin Justin. I haven’t seen Justin since the early 2000s, so it was a happy reunion. We ate lunch at the event barbecue, which was held at the Imperial River Lodge, a hotel next to the river. Me and my cousin Justin. Don’t you love his pink shirt? Each picnic table had a decorative bra for a centerpiece. The bras were designed and donated in honor or in memory of loved ones. I wish I’d known about that in advance, because I would have put together a pretty freakin’ awesome bra for my mom! I met some representatives from the hospitals and organizations in Oregon that would be receiving proceeds from Splash for Pink. They were armed with quite a few informative pamphlets about breast cancer and breast health. I passed on my blog business cards to them to give to their patients. I also met a lady named Deb Hart, who is a breast cancer survivor and motivational speaker. She spoke for a few minutes during lunch about her experience with breast cancer, so I found her later to chat. She was sitting with a few other women. I mentioned that I just had a double mastectomy, and all three of them jumped up and started hugging me. It was great! I felt like a celebrity or something. I explained to them that I did my surgery prophylactically and they were very impressed. One of the ladies, Sandy, even gave me a beautiful tote bag as a gift! Sandy sells hand-woven totes made by craftsmen in Oaxaca, Mexico. My bag is pink and silver and I love it—I’ve been hauling around shoes, my laptop, my makeup, my brush, and my hair products in this bag for the last few days, and it’s very sturdy. It’s waterproof so I’ll be using it at the beach and the lake. It was a really gracious gesture on Sandy’s part! (On a sidenote, if you’re interested in buying a tote bag like mine or just want to check out the other merchandise, the company is called Abrazo Style and the website is www.abrazostyle.com). Check out my awesome tote bag! Once lunch was over, it was time for rafting. For the record, our official rafting crew consisted of: my mom, my mom’s friend Arlene, Bryce, my cousin Justin, my aunt Jackie, our guide Lynn, and me. We really wanted Uncle Pat to raft with us, but he has a bad back so he drove the van instead. This worked out well because he stopped and took tons of photos of us. I haven’t rafted on the Deschutes in years and had forgotten how much fun it is—and how wet you get! Next time I go rafting I am definitely skipping the mascara. After just one rapid, I looked like a raccoon, so during a calm section of water I jumped into the river to wipe my makeup off. Yeehaw! Riding the bull through the Elevators rapid. Just a few minutes after we finished the last run on the river, the rain started. Perfect timing! It poured for about 45 minutes, but luckily the Splash for Pink organizers were prepared for rain. The festivities were moved under a tent. There was a live band, food, a bar, and a raffle. I really wanted to win the pink .22 rifle, but someone else got it. =( Oh well. Splash for Pink was just a one-day event, so the next morning we headed back to my aunt’s place. We spent the afternoon relaxing and recovering from the rafting. I was definitely sore! On Monday, Bryce and I flew home to Los Angeles while my mom and Arlene (and Madeline, the road-tripping doggy) drove back to California. Save for a long delay (three hours) at the airport on the return flight, I’d say the trip was a major success. It was very touching to see an entire community unite in support of such a great (and personal) cause. 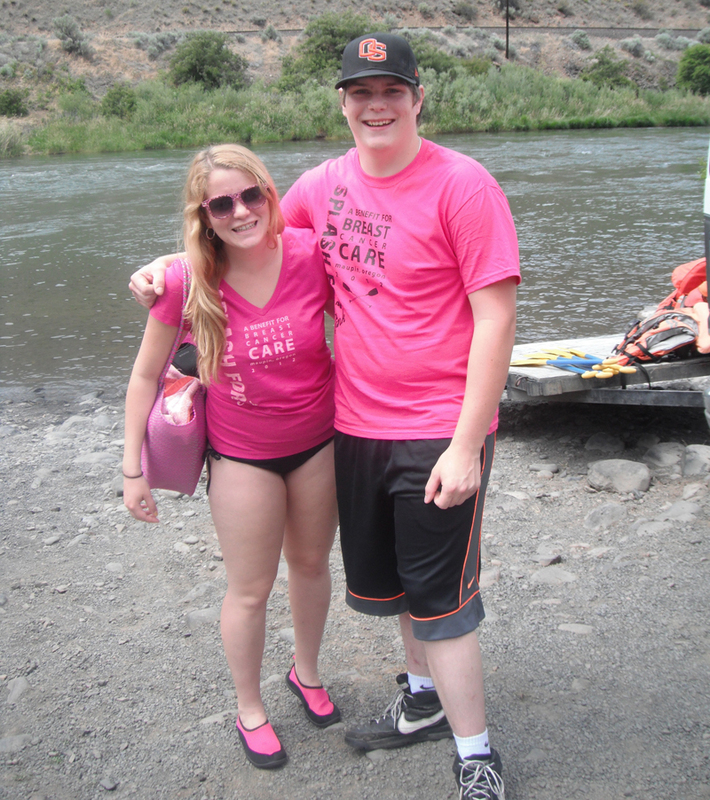 I am certain that everyone in Maupin, Oregon participated in Splash for Pink. Many local businesses donated auction items, and other sponsors, like the rafting companies, helped make the event a reality by donating their time, space, and resources. I certainly love my breast cancer charity walks, but hopefully my future will be filled with other innovative fundraisers like Splash for Pink. Does anyone know of any?! 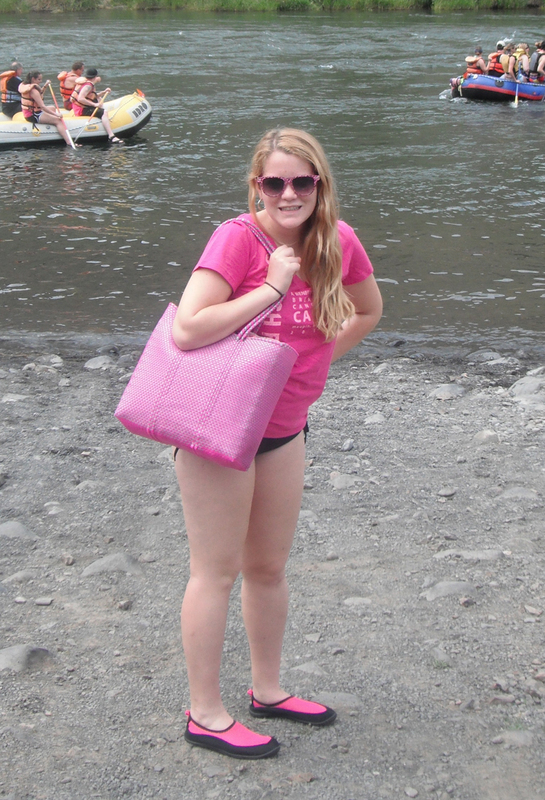 This entry was posted in Breast cancer, Fundraisers and tagged Breast cancer, charity, fundraiser, Hood River, Maupin, Oregon, river rafting, Splash for Pink, tote bag by Rachel Joy Horn. Bookmark the permalink. That sounds awesome! Glad you are up for good times! Sounds like a great time. 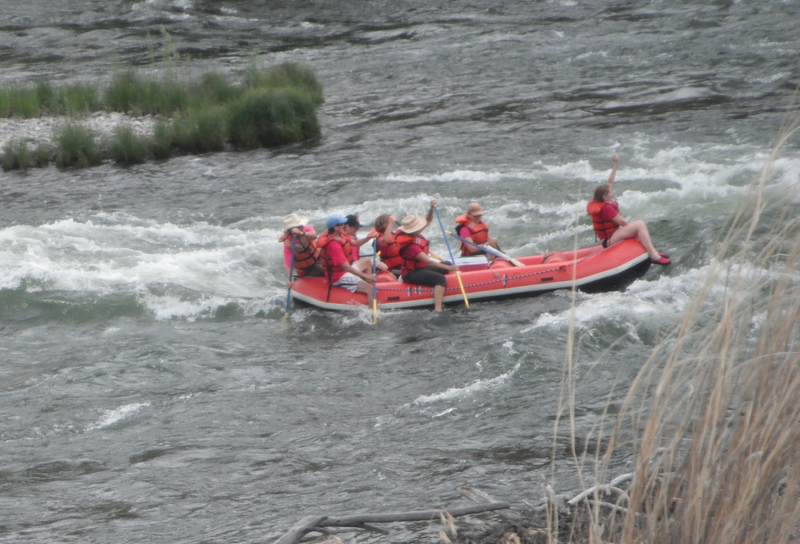 Next time you’re in town you’ll have to try rafting the White Salmon river! It’s beautiful! I totally agree about the White Salmon. Rare and Rugged Beauty.